It was the simplest of questions, and one that I was expecting. The query came from Britta Schellenberg, VP of Corporate Marketing at BrightCove, and the kind of woman you’d follow into battle if the opportunity ever arose. The team had invited me to speak earlier that day at PLAY 2018, and our conversation was meant to focus on social media, digital marketing, and the use of video. But, as I am prone to do, we took the discussion a bit off-topic. Check out video of our full conversation here. And thank you, Britta, because after your question, I found myself pondering the role of truth more and more. Truth is at the core of every major movement in history. The #MeToo movement, for example, is simply about exposing the truth, one story at a time. Truth often challenges us. It’s uncomfortable. But within that tension comes growth. This idea of using assertive truth in the B2B purchase process has always been the most appealing aspect of The Challenger Sale to me. They provide customers a credible, surprising way to operate more effectively. This leads to higher levels of loyalty, and ultimately, greater growth. That’s immense power grounded in truth and insight, rather than hyperbole, or spin. But, this is not simply an issue that's important to our modern marketing and sales climate. Today's Guardian article demonstrates the current state of truth in our world. For me, this is one of those “if you’re not worried/outraged, you’re not paying attention” moments. Lying and dishonesty are becoming commonplace, though they are fundamentally opposed to the tenets of a free society. The majority (more than three in four) of Americans do not believe lying is “the American way,” yet two-thirds of U.S. residents say people lie to them, at least, some of the time. What’s the impact of this post-truth world? We need to be honest about the role of the noise being created today by the endless barrage of information we are subjected to. A constant news cycle dominates our attention, and both media sites and social media platforms incentivize outrage and extremism. It’s overwhelming. American Psychological Association Stress in America™ Survey found that more than half of Americans (59 percent) said they consider this the lowest point in U.S. history that they can remember — a figure spanning every generation, including those who lived through World War II and Vietnam, the Cuban Missile Crisis and the Sept. 11 terrorist attacks. 4. This is both an opportunity and a threat. Speaking on behalf of anyone in business, especially marketing, or the media, we can look at this in one of two ways: as a threat, or an opportunity. It certainly poses a threat to democracy. But here’s the thing for marketers. Every business now operates within these parameters. I continually advocate for brands who tell the truth (see my work on femvertising), question the way things are, and spark dialogue about what they could and should be. It creates real human interaction - and grants us the elusive prize of attention. But not ONLY is truth the surest way to cut through the noise; not ONLY is it the first step towards earning trust with buyers; not ONLY might it contribute to a better perception of our industry; but it's psychologically, downright, without a doubt more effective. Telling the truth works. It also just happens to be f*cking radical today. Heck, our buyers are so sick of marketing hyperbole, it’s innovative just to be honest and straightforward. Doug Kessler coined the phrase of using “insane honesty” in content marketing, and shows in his excellent presentation the surprising power of showcasing a brand’s weaker points. 5. Truth-telling requires us to evolve. Truth-telling requires a departure from what we were. It’s an opportunity for us to re-think what marketing is, and should be. Conviction: Honesty and truth-telling take conviction, especially when these values run counterintuitive to the role marketing has traditionally played. This is a long-term play, not a short-term mindset. It’s not something you can back away from once you’ve made the decision to own it as a brand. Respect: Unlike most marketing, truth-telling requires us to respect buyers. Consider the fundamental difference between persuasion and manipulation. Persuasion is done with people, manipulation done to them. Truth-telling puts the buyer on the same playing field. Manipulation inevitably underestimates those being coerced - and that’s how brands and leaders get in trouble when exposed. Bravery: Whether an individual or a brand, it takes courage, bravery, and chutzpah to put unspoken truths to words, take a strong POV, and defend it both internally and in the market. Some truth-tellers, like Kenyan activist Boniface Mwangi, (that graffiti at the top of this piece is part of his activism) risk their lives to tell the truth. Mwangi's truth focused on the impunity of politicians in the face of over 1000 dead and half a million people displaced as a result of the violence they caused. Now, that’s Kenya, ruled by a near-dictator. In our system in the US of Democratic capitalism, I’d like to think, the rules are different. (For now, at least.) The wins belong to the smart and the brave and the bold. We can't afford not to stay quiet - both in marketing, and in activism. We need to hone our voice. “In spite of being arrested, beaten up, threatened, the moment I discovered my voice, that I could actually stand up for what I really believed in, I'm no longer afraid.” - Mwangi. And throughout it all, tell the truth. Marketers, welcome to our new charter. After all, the truth will set you free. I write about what I find interesting - problems/concerns in marketing like attention, persuasion, and trust. For more, subscribe to The Katie Martell Weekly. Every week I send out new ideas and articles. It’s free & curated by me. Are you on the list yet? 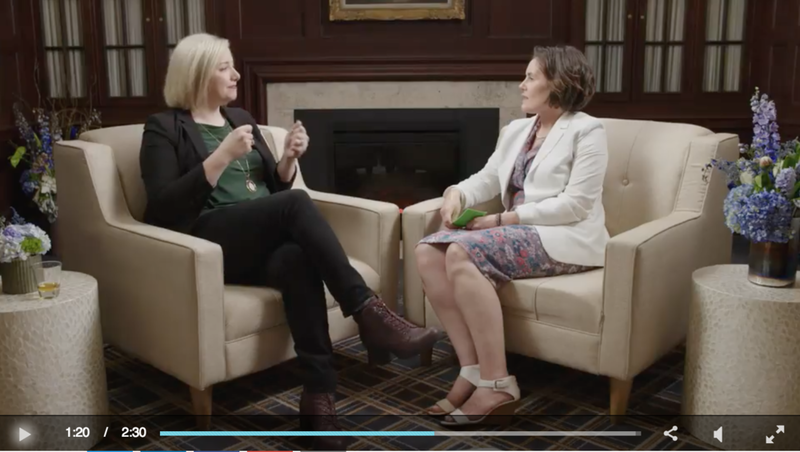 Watch my full interview with Britta at Brightcove.